The 2015 summer season is almost over, and Venice is still packed, as it is every other year, with the usual polluting multitudes (as Shelley put it), but the art tourists too, for the Biennale. (This year’s offering has the predictably unfathomable title All the World’s Futures.) The Giardini and the Arsenale are teeming with youngish arty types earnestly absorbing all the “message art” written in bad English, or the meaningful (or meaningless?) installations. But of course, the Biennale extends beyond these two main exhibition spaces into many beautiful palazzi in Venice itself, buildings which usually you don’t get to see inside. And often the art here is more rewarding, perhaps because it can be viewed in a beautiful context. The other bonus is that these display spaces are often free, whereas a visit to the Giardini and Arsenale will cost you €25, and a wait in a ticket queue of at least 15 minutes. In addition, this year’s Biennale is less well organised for the hapless tourist who maybe only has a long weekend in Venice. Both the main sites are closed on Mondays, whereas in previous years, one remained open on Mondays and closed on Tuesdays. 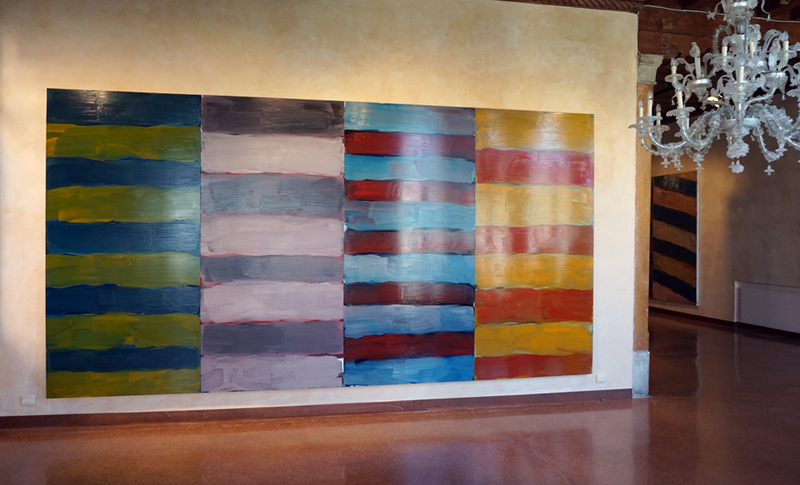 Perhaps the most important artist on display in a palazzo is Sean Scully, born in Ireland, educated in England and with studios in New York and Munich, whose work can be seen in major collections throughout the world. The entire Palazzo Falier on the Grand Canal is given over to displaying his work, large glowing horizontal layers of paint, or smaller interwoven stripes of muted greys, blacks and whites. The bare rooms with their original terrazzo floors are the perfect space in which to display these geometrical abstractions, contrasting with the dappled moving light filtered through the ancient glass windows. Sean Scully: Photo credit, Art News. A note of caution, though. The information about the Biennale doesn’t tell you that there are two Palazzi Falier, and the one I looked up in the index of my guide book turned out to be a hotel, and most definitely not part of the Biennale. The one to see Scully’s work is near the Accademia Bridge. Another distinguished artist, Peter Doig, can be found in the Palazzetto Teti (Fondazione Bevilacqua) near Campo San Barnaba. This building is another visual treat overlooking a quieter canal in Dorsodouro, all the more interesting when you discover that the 95 year-old owner lives upstairs. Doig’s canvases – large as well as more intimate - of curious images including a man in a wet suit, and – appropriately for Venice - lions, look calmly magnificent in their 17th century setting. By far the most beautiful of the palazzi used as exhibition spaces for the Biennale is the Palazzo Grimani built in the 16th Century for Doge Grimani. Unless you know about it, you won’t find it. The entrance is at the end of a dark alleyway off the Campo S. Maria Formosa. The hordes of tourists pass by, unaware of such an architectural gem. It has a permanent collection of art (Bosch, Giorgione, Vasari) as well as some of the most important frescoes in Venice. The foliage room with its ceiling of painted trees, birds and flowers is particularly lovely, and the room used for Grimani’s collection of antiquities, lined with marble and lit from above by a lantern tower, has a sculpted angel suspended in space. 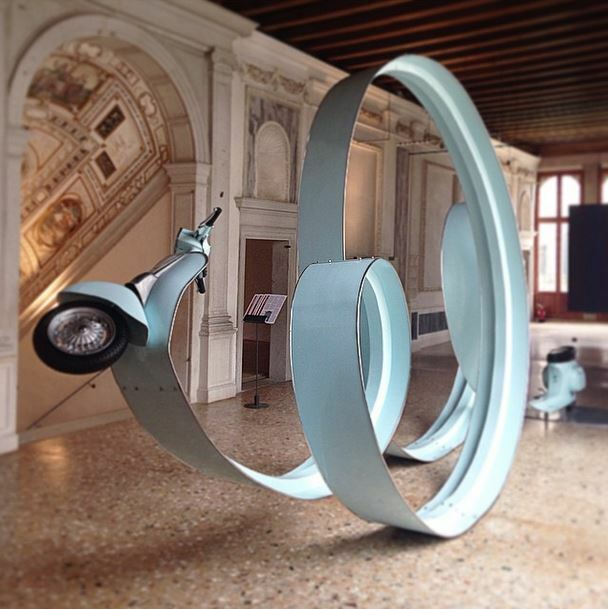 The addition of pieces by contemporary artists for the Biennale includes as amusing astonishingly elongated Vespa, the middle part of which does a loop-the-loop, and the ethereal sounds of the sets of gongs by Georges Fikry Ibrahim. I have to confess, if it isn’t already obvious, that it’s paintings I want to see rather than the latest gimmickry produced by the art world. Nothing will persuade me to be impressed by the work of Sarah Lucas, our representative in the British Pavilion in the Giardini, whose brand image of a woman as two fried eggs and a kebab seems to me to be puerile, like the work of a sniggering adolescent. The best treat of the Biennale is to be found in the Museo Correr, at the opposite end of St Mark’s Square from the Basilica. Amazingly, on a hot June day, only four people had chosen to see the exhibition of Nuova Oggetivita there, and one of those was me! It was thoroughly absorbing, informative and refreshingly air conditioned. 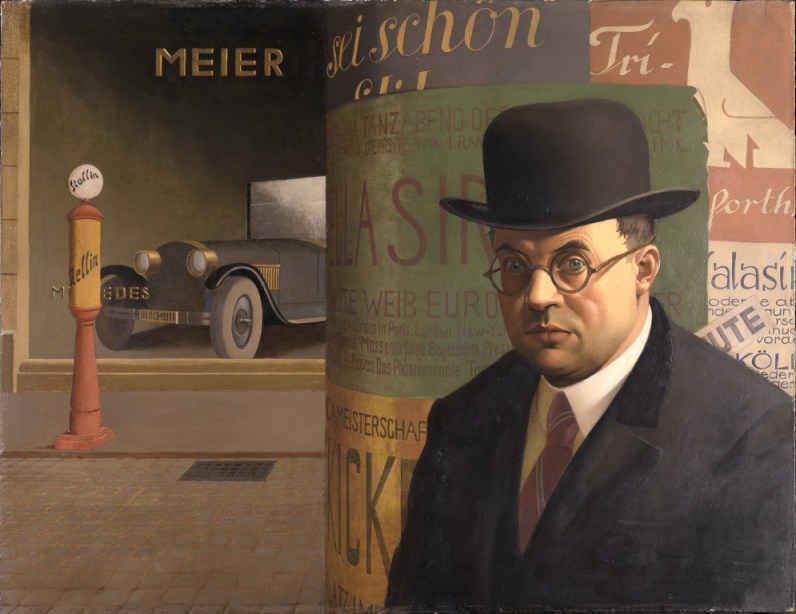 I knew nothing about this short-lived art movement of the 20s and 30s which emerged as a result of extreme deprivation in Germany after the First World War, examining German society with forensic detachment. It aimed to show the hardship of the time in all its ugly brutality, the starving unemployed contrasting with fat cat businessmen, or overblown weary prostitutes treated as commodities, or in one case, having just been killed. These are the paintings, by great names such as Otto Dix and Max Beckmann, which Hitler denounced as degenerate and ordered to be destroyed. There must have been many more, but these hundred or so eloquent images have survived. If only the Venice Biennale had copied the BBC’s aims, “to inform, educate and entertain” we might today be able to see works which are sensually rewarding and food for the soul. Edgy transgressive art which invariably has to be explained by psychobabble leaves the visitor at best puzzled, and at worst frustrated. Luckily, there are little oases where the art can still move the spirit. For other ideas on discovering Venice, read our recent articles on what museums to visit, and the 72nd film festival. You can browse our properties for sale in Veneto or these incredible hotels that you have to see in person to believe.